In 2012, Harvard business school declared data science the sexiest job of 21st century. Corpnce’s simple and concise course covers everything from basics to advanced concepts required for industry. You don’t need any prior knowledge to start our course. This course will give hands on experience in Python programming for data science and in depth knowledge of statistics and machine learning models. Since we follow PBL, you will team up with other learners to solve real life data science problems that will help you create the essential critical thinking and team building required for industry. You will master the concepts like data accumulation, data wrangling, data exploration, data visualization and predictive data modelling. What are you waiting for? No matter if you are a fresher or a working professional, our data science course will ensure guaranteed growth of your career. 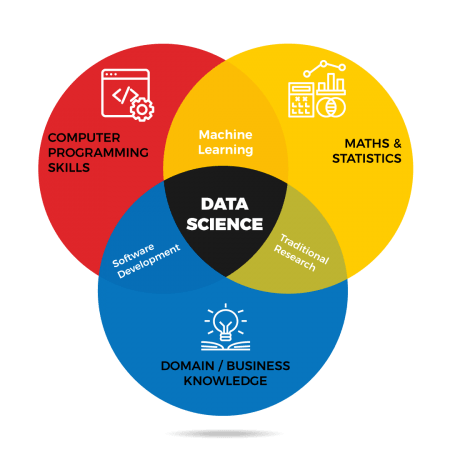 Data science is the field of study that combines domain expertise, programming skills, and knowledge of math and statistics to extract meaningful insights from data. Youtube – Uses Data Science and Machine learning to recommended videos basing on users watching preferences. Netflix – Mines user viewing patterns to understand what drives user interest and uses it to make decisions to produce Original New series. Example: House Card of Card. Google – Google search is another good example of predictive analytics. Proctor & Gamble – utilizes time series models to more clearly understand future demand, which help plan for production levels more optimally. Amazon.com – Amazon recommends product by analyzing user’s buying behavior. The way Companies/Organization take crucial business decision is changing with DATA SCIENCE. We are moving from intuition-based decision making to data driven decisions. Data Science integrates the traditional data analytics with state of the art – machine learning techniques (predictive analytics) to take better decisions with lower risk. 21st Century is termed as “THE ERA OF ARTIFICIAL INTELLIGENCE” and “DATA IS THE NEW FUEL”. Technology is a part of revolution that changes with time. Computer has become an integral part of our work but has seen lot of change in technology. The revolution today is to create Artificial Brains that Mimic Complex Human Behavior. Data Science, Machine Learning, Deep Learning etc. all the buzz word is just another technology that aids this AI revolution. To be part of this you need to a starting point- Say Hello! To Data Science. This course provides a programming base, specifically designed for the professionals who want to learn Python to use it in the field of Data Science, Machine Learning, Artificial Intelligence & Other emerging technologies. Suitable for top executives/managers/ learning enthusiasts to get a hawk eye view & have an overall understanding of Data Science & other related concepts without programming. History of Data Science | Illustration of how Data Science & Analytics are used across different sectors | Practical understanding of methods used by data scientist; statistical thinking and conditional probability, machine learning and algorithms, and effective approaches for data visualization | Glimpse of usage of Natural Language Processing(NLP) & other emerging technologies. This course is mend candidates who are looking for crash course in Data Science and want get the maximum in minimum time. This course is specifically mend for professionals looking to change domain or want to embrace the AI revolution or seeking a job. This is an extensive course with 4-6 industrial projects and with one strategic intent of making candidates ready to deploy. Why you should take this course now ? This shows the popularity of Data Science in last 5 years collected from Google trends. Reports from IBM and Forbes magazine confirms that it is among world’s top 5 technologies that will continue to grow for next 10 years! Data Scientist are the highest paid IT professionals and as per the report by payscale.com, the growth of a data scientist is almost double the average. There is a huge demand for data scientists today. The US data science market, require 190,000 data scientists by 2018 and India needs almost 50,000 such positions. Almost 10,000 data science jobs will be for freshers in 2018, out of which Bangalore will have 4000 vacant positions. Bangalore will have total of 20,000 vacancies for data scientist in 2018. Here is a graph that explains the job demand for data analytics from 2014 to 2017 in India. Python is now the most preferred language for data science surpassing ‘R’ in mid of 2017 and the job vacancies in data science using python is getting more popular across industries. Python replaced JAVA as the core language to be taught in schools. Just fill in this form to receive a free copy of this E-Book. Am I the right candidate for Data Science? Working professionals from any industry with prior coding knowledge or exposure to data driven process is preferred. Incase, their profile doesn’t match above criteria they need to qualify the python fundamental test & TQ evaluation test to take up the DS course. Technical Student from Engineering, MCA, BCA, MTech, PHD, Medical, Statistics, Finance can join the course subject to initial screening same as for working professionals. I am a final year engineering student or fresher, will this course help me? Our course syllabus is designed from basics all the way to advance concepts, so freshers will not face any problem in projects. Since the demand for data science is more than the current resources, we can expect some huge opportunists coming in near future. Currently we need 4000 fresher in data science by 2018. It’s a good number! The duration of the advanced Data Science course is 5-6 Months for weekend batches. We don’t compromise with the quality of teaching and also make sure to complete the course in right time. For other courses refer the course particulars. What is the prior knowledge I need to have to start this course? No, you don’t need to but if you have strong fundamentals of statistics, mathematics and basic knowledge of python then it is a bonus. Will I get any placement assistance from Corpnce? Placement of an individual depends solely on the candidate’s caliber. There are many factors that determines your placement – Communication, Technical Skills & Projects that you have done during course. And the most important factor is your performance on the D-day. We do offer 100% Placement assistance to all the deserving candidates and the brighter ones make it to our in-house internship. As the term suggest, it is a research oriented job and that’s what makes it interesting and different from other jobs. Data Scientist are the highest paid IT professionals since it needs in depth knowledge of statistics, love for data, logical reasoning, critical thinking, understanding of mathematics and fair amount of programming skills. If you love to explore and have the attitude to learn then you don’t need any masters or PHD degree to become a good data scientist. Professionals in different job functions or industries who want to help their company leverage big data should learn data science. Apart from students ,other professional who can benefit by learning data science are database administrators, business analysts , Statisticians, researchers, computer scientists and data engineers. Candidate is suppose to have the basics of Python for DS before enrolling for the course. They shall be evaluated before joining the DS course. And the candidates need to put in at least 10-12hours of time towards the course over and above the class hours. What is the prospect after going through this course? Data Science as a career option save you from the upcoming job-insecurity as well as this is the stepping stone to AI. Corporate: Individuals from industry can expect at least 35-40% hike; in their current salary upon switching internally to the Data Science division and along with this they are going to immune to the upcoming job in-security thanks to Ai revolution. Do you provide any certification? What’s the value of the certificate? What’s the job scenario in the market? As per reports of Analytics India magazine there are more than 92000+ Data Science related jobs available in India. So, there is ample of opportunity for people with experience in the industry whereas for the fresher starting off as an intern opens a wide array of job opportunity. What’s the difference between Data Science, Big Data & Data Analytics? The Data driven decision making starts with relevant data collection for the right problem statement. In the pipeline Big Data people who are also known as Data Engineers, are responsible for storing, collecting and systemizing the data. They supply right data at right time for analysis. Data analytics (DA) & Data Science (DS) Engineers use the extracted data to get meaningful insights. DA is more focused towards Data Visualization & Data Screening, they might or might not need any coding skills as most of their work can be done on Excel Sheet/ Spread Sheet. They are more focused towards analyzing the past performance of the company. Whereas the DS Engineers are more focused towards one very specific branch of statistics – predictive analytics. Here they need to have strong coding skills, math’s & stats skills and most important Machine Learning as a toolkit. So they can predict future performance of a business along with analyzing the past and present. How is Data Science & Machine Learning related with AI? Machine Learning & Deep Learning are the subset of Artificial Intelligence (AI). Data Science includes Machine learning & Deep Learning as predictive models along with Exploratory Data Analysis. A Data Scientist needs to have good ML skills and intuition to raise right question to solve business problems. Whereas, ML & DL engineers are only focused towards specific prediction problems like image processing, Natural language processing (NLP), pattern recognition, Semantics, Crowd Computing, Sentiment Analysis etc. So, in brief a DS knows the fundamentals of all ML & DL techniques for basic problem solving whereas ML engineers are more focused towards specific problems.